In kindergarten, students use their mental and physical strength for exploration in all disciplines. During their time at Learning Ladders, students will develop strong foundations through our curriculum, which will follow them through their academic careers. The focus is on Language Arts, Mathematics, Science/ Technology, World Languages, Performance Art, and so we will cater to the development of a well-rounded sense of wonder. Kindergarten teachers will plan lots of discovery-oriented activities and even whole days of exploration. Kindergarten math activities can be as simple as counting the number of blocks a child uses to build a tower, singing songs about numbers, or playing games that require dice or a spinner. 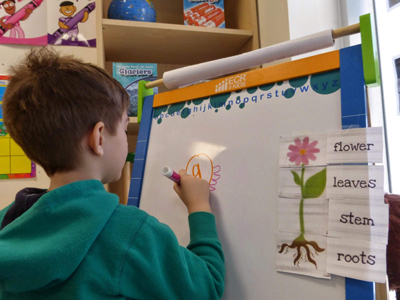 Kindergarten classrooms also contain many exploration areas. Understands the difference between right and wrong and recognizes and respects authority figures. Can play independently or in a small group without needing to be constantly supervised. Skill: Is beginning to take turns, share, converse and play with other children without needing to be reminded and uses polite language. Likes to make decisions for himself, explores new things and take some (safe) risks. Begins to establish right or left dominance, that is, show a preference for using one side of the body more strongly than the other. Shows increased flexibility, strength and dexterity in small muscle groups. Has the ability to climb stairs using alternating feet, can balance on one foot, hops, runs, skips and jumps. Has the ability, coordination and muscle strength to be able to control breathing. Can mimic movements and move in a variety of different directions. Categorize objects. For instance, he may place blocks in a row from shortest to tallest, or group items by color. Count ten or more objects. Recognize and write numbers up to 10. Sort objects into specific categories. Compare the length, weight, and capacity of objects. Identify and possibly draw shapes such as circles, squares, diamonds, rectangles, and triangles. Understand broad concepts of time, including “yesterday,” “today,” and “tomorrow”. Identify the seasons of the year.